Almost 70 percent of Oregon is now in "severe drought," with parts of Southern Oregon lapsing into "extreme drought." There appears to be little relief from the hot, dry and smoky conditions that have plagued Oregon this summer. Forecasters expect hot and dry conditions to continue well into autumn, exacerbating a drought that grows deeper by the day. 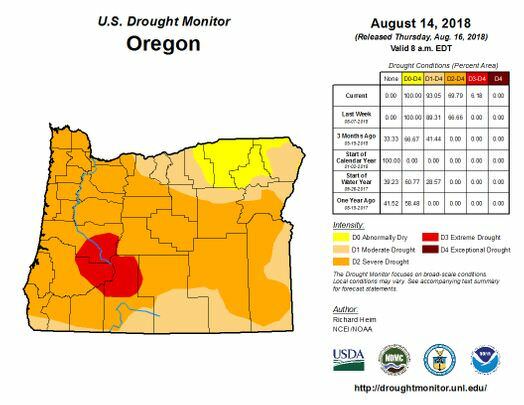 Almost 70 percent of Oregon is now in “severe drought,” with parts of Southern Oregon lapsing into “extreme drought,” according to the U.S. Drought Monitor report issued Thursday. The historically dry conditions mean the eight large wildfires currently burning across Oregon could continue spewing smoke into October. New wildfires could easily ignite. The only upside of the smoke, which has brought unhealthy air to the Willamette Valley and hazardous air to Southern Oregon, is that it has slightly cooled temperatures. Salem has had 28 days above 90 degrees, which is above normal but still short of 1958’s record of 34 days above 90 degrees, officials said. Portland, however, is on the verge of breaking the record for the most 90 degree days in a single year with 29 so far. The record is 30. 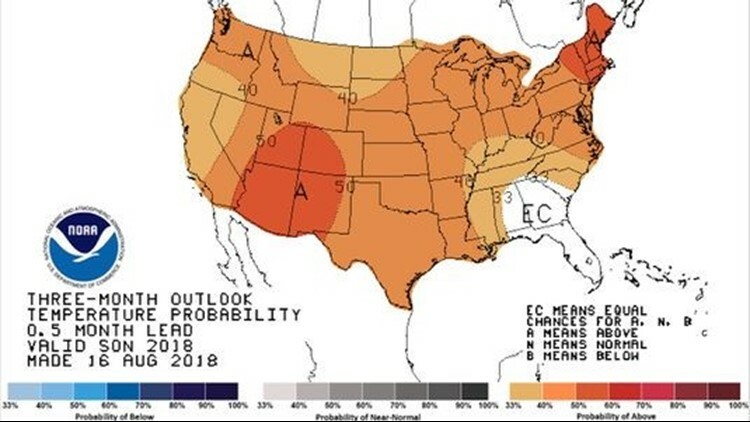 The long-term forecast for September and October comes from a report issued by the Climate Prediction Center on August 16. It places odds for hotter and drier than normal weather at 40 to 50 percent for the next three months. Zach Urness has been an outdoors writer, photographer and videographer in Oregon for 10 years. He is the author of the book “Best Hikes with Kids: Oregon” and “Hiking Southern Oregon.” He can be reached at zurness@StatesmanJournal.com or (503) 399-6801. Find him on Twitter at @ZachsORoutdoors.